Residential & Industrial Window Cleaners Hackney E | Quality Property Care Ltd.
Meet the innovative residential and commercial specialized window cleaning! See how quick it is to get your windows as clean as a whistle. Get some rest, while the experienced and well-trained window cleaners show their best in your property. Get in touch with us on 020 3746 4287 to receive more detailed information about our best rated and hassle-free services. To achieve our famous final results we use a simple water-purification method which strips away normal tap water from its minerals. This leaves it a basic H2O molecule which is a lot lighter and sticks a lot more to dirt, grime and mud. The technique is a very effective way of cleaning away even the dirtiest of window surface types and can reach up to 4 stories in height. 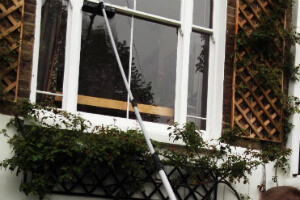 Using a telescopic water-fed pole we clean the windows and window sills from the top to bottom using only water, no detergents as detergent bring in even more dirt if not rinsed with water. In addition detergents may have corrosive properties on PVC surface types and cause the gasket and seals of the windows to rot and decay faster. The length of the water fed pole lets us to clean business buildings without having to use a ladder or ropes. Rope systems are offered for commercial clients, call us at 020 3746 4287 for more information. Quality Property Care Ltd. performs with all kind of business properties, all kind of home properties and does it at reasonable rates. We add sticker removal procedure, if needed, as well as modern rope access window cleaning procedure for blocks, houses, buildings. Don`t forget to mention, if you need urgent or same-day service. 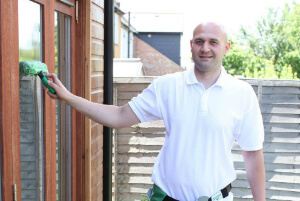 We are helpful and flexible , so we can organise the home window cleaning service in a most convenient for you way. We work 365 days per year - no exceptions either for holidays or weekends . Re-scheduling is possible and Totaly free. Don`t waste time, but contact us on 020 3746 4287! Get a totally free estimate now! See our budget friendly price list and get a booking for safe and helpful window cleaning in Hackney E now!